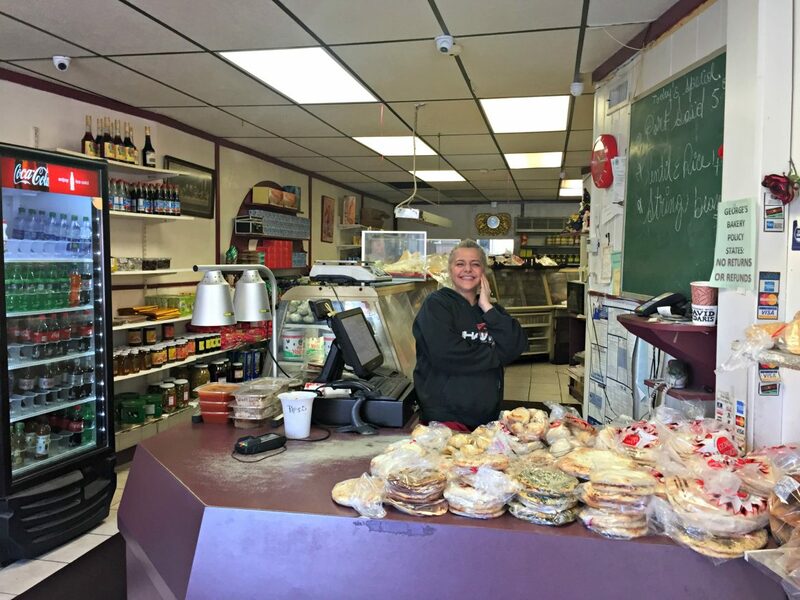 Grace Dahrouj is pretty much always behind the counter at George's Bakery, where she's become the face of the business to its many loyal customers. This article was originally published in the April 30, 2017, edition of the Sun. As simple as it is, this food has been around about as long as humanity. It’s considered the poor people’s food, a symbol of communion, the foundation of many ethnic dishes, and even a curse for those on diets. Bread has many forms, and pita bread in particular is a must in the Middle Eastern culture. 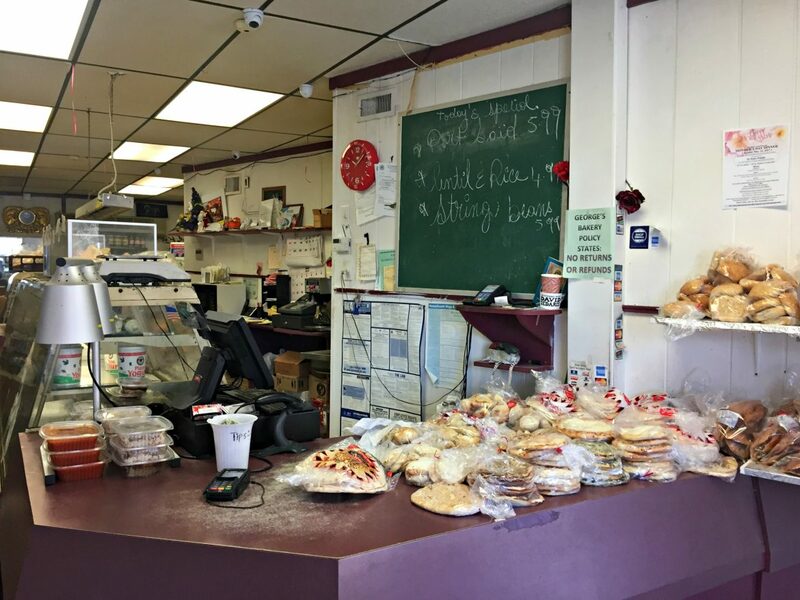 George’s Bakery, a Grafton Hill staple tucked in at 308 Grafton St., sells freshly baked pita bread, along with typical Mediterranean pantry goods. 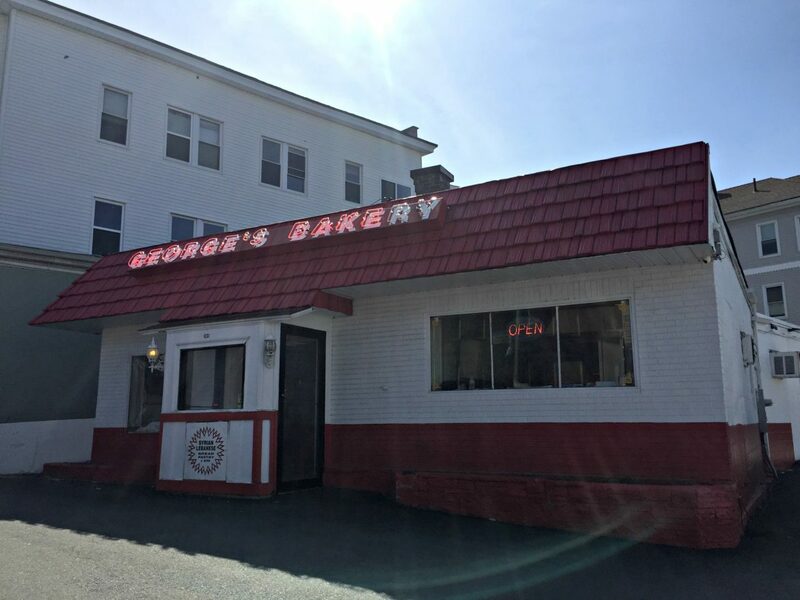 George’s Bakery first opened 61 years ago. The original owner — and original George — George Salloum sold his bakery to George Elhoussan 25 years ago. Grace Dahrouj, an employee of George’s Bakery for 16 years, has become the face of the business. “I cook, I sell. I do almost everything here,” she said. She said the bread and the pies are the best sellers of the bakery. “So many people love the pies and bread. They have no preservatives and no sugar,” Dahrouj said. It may be easy to purchase bread and it may be even easier to consume it, but producing the bread is no simple task. Pita bread, Syrian and Lebanese varieties, is front and center at George’s Bakery. The bakery is separate from the actual store. Workers come in from 1 a.m. to 6 a.m. every morning to bake the bread and other foods. They use an updated large bread machine to produce massive amounts of dough. There are two main types of pita bread. One is thinner and larger, and is considered Lebanese bread. The other is thicker and smaller, and is named Syrian bread. Though the bakery’s products are authentic to Middle Eastern standards — and thus have attracted generations of city families that hail from the region — George’s boasts customers from all cultures and communities. Dahrouj believes she knows why. “It’s the customer service,” Dahrouj said. “It’s all about the personality. The food’s great, but if you don’t have good service, if you don’t have people to welcome the customers, they leave. 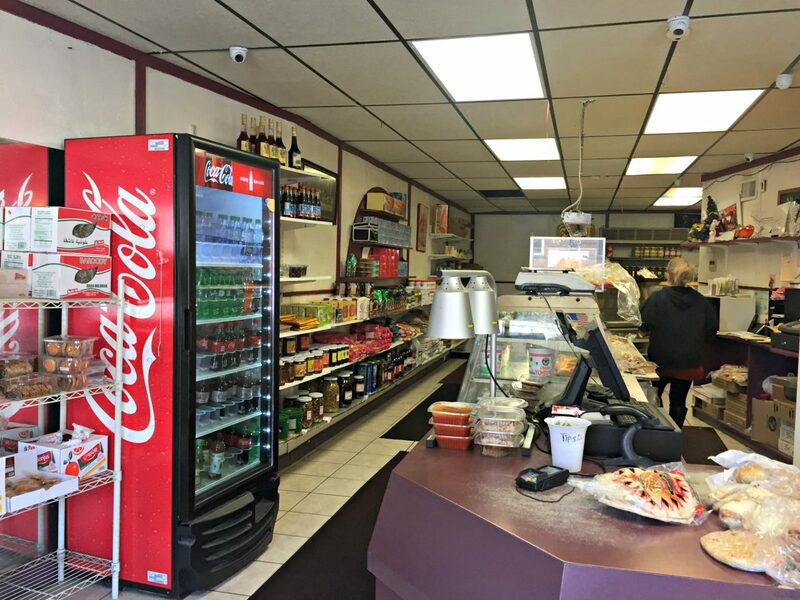 George’s Bakery offers a variety of authentic Mediterranean and Middle Eastern staples. Besides the service, Dahrouj admits the tasty food contributes heavily to the bakery’s success. “It’s about the food and the product that you sell,” she said. The bakery’s consistency and reputation has customers returning. Ultimately, George’s Bakery’s success derives from its many loyal customers. One customer, Lucian Sbat, visits the bakery about three times a week. He consumes anything from the freshly made food to the groceries. “Spinach pies, meat pies, grape leaves, I get pretty much everything. There’s kibbeh balls, cabbage rolls. I like the stuffed zucchini and eggplant too,” he said. Sbat came to Worcester from Aleppo, Syria, 18 years ago. He has shopped at George’s Bakery for the last 10 years. He heard about the business shortly after his arrival in Worcester, but could never believe his friends when they’d try to convince him the bread tasted authentic. “It’s popular in Worcester and everybody spoke good things about it. It’s [the bread] exactly the same,” he said. Lucian Sbat comes to George’s Bakery about three times a week, he says. Every Wednesday and Friday, George’s Bakery sells vegan options for people who fast on animal products. As for the groceries, Sbat purchases anything from plain yogurt to Turkish coffee, and canned Middle Eastern foods, such as chickpeas and hummus. When Sbat has guests at his house, he orders food one day ahead of time and picks it up the next morning. He also gets his pita bread from George’s Bakery, a Syrian food essential. “I use the bread to make wraps at home. It’s really easy to wrap the bread because of how fresh and how good the quality is,” Sbat said. As popular as it has become, one bakery seems to be enough for Elhoussan. Regardless of having no intentions to bolster the business, George’s Bakery has its own way of reaching out beyond the Worcester community. 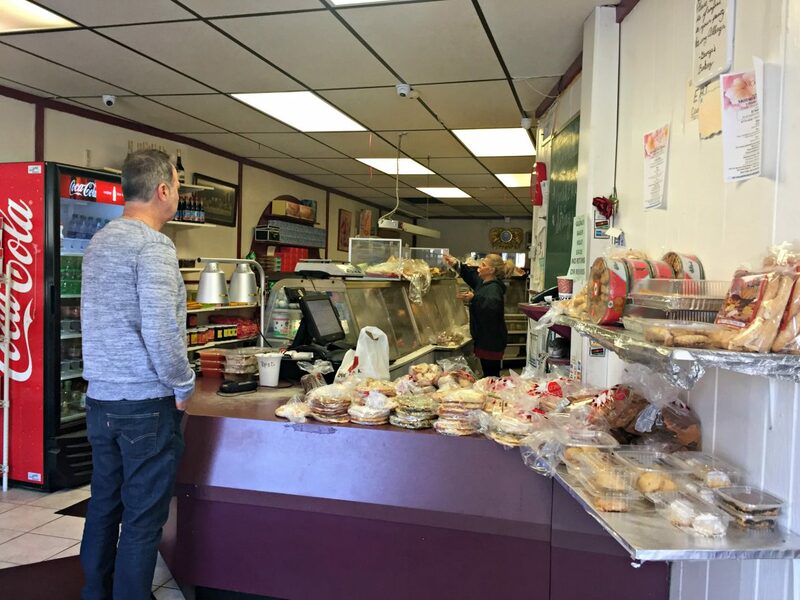 George’s Bakery, 308 Grafton St.
Elhoussan sells a majority of the bread to suppliers who distribute the bread to markets — like grocery chains Price Chopper, Stop & Shop and Shaw’s — and local pizza businesses in and around Worcester. “You’re expanding the business without even expanding it by sending it out and selling it to people and people deliver them to the markets,” Dahrouj says. For miles around, thanks to George’s continued hard work on Grafton Street, an authentic taste of the Middle East is just a pita package away. George’s Bakery, 308 Grafton St. (at the corner of Cutler Street and across from Grafton Street Elementary) is open 5 a.m. to 6 p.m., Monday through Saturday. Check out their menu here. Fay Bcharah was raised in Worcester and is pursuing a sociology and communication major with a concentration in journalism at Worcester State University. As an editor for the New Worcester Spy and writing consultant at WSU’s Writing Center, Fay’s passion for writing plays a significant part of her life. She also enjoys writing poetry and creative fiction. Fay aspires to continue her higher education and eventually receive a doctorate in writing and rhetoric. Look for more of her work coming soon in Worcester Sun.